By now, most of you have already seen the new 3DS second nub attachment (and if you haven't...look above) and most of you, (judging by the comments) have raged at the thing. Whether it be because of the look, or because of the concept, the darn thing can't catch a break. Yet, I feel that much of this discourse may not be very well founded, and I would like to offer a few rebuttals. We don't know how it came about. I'm sure there have been fans who have wanted a second nub considering the fact that the Vita will have one. This puts Nintendo in a predicament. 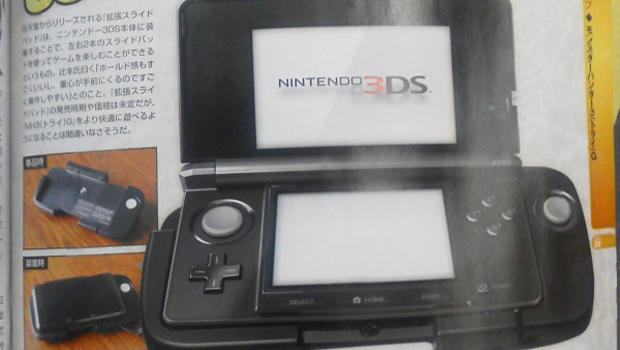 What if this attachment wasn't an excuse for Nintendo to decide to make a new 3DS, but a result? If they were to simply announce a new model, the current 3DS owners would feel slighted. Instead, this is a way of Nintendo to allow them to play the games that will be compatible without having to go out and buy that new model, instead paying a much smaller amount on an add-on. Furthermore, we don't even know if it will be something that becomes standard in future games. It might. Or it might just be something used in a minority. Nintendo hasn't needed that second nub until this point, because they don't offer as many games that make it a necessity. Even if there do end up being games that offer it as an option, it could just be that; an option. If it makes your experience better, you can go out and get it, or you could ignore it. Moreso than anything else though, I think we need to look at it and recognize what Nintendo is trying to do: Improve the handheld. They are not taking anything away, they are not forcing you to buy it (at least not yet). They are trying to make the experience better. The 3DS had a bumbling first several months, but now with Nintendo trying to fix some of the mistakes that the fanbase made incredibly clear, is it worth bemoaning it? The 3DS's problems have happened; they're in the past, no one can change them. Can't we just, for once, appreciate them trying to bring it up to our expectations? If nothing else, I ask you this: In ten days, Nintendo will have their 3DS press conference before the Tokyo Game Show, where they'll go over this, and their plans for the future. Then we can see where this is going. Can we just keep an open mind until then?